Dear Francy; My mom and dad have hit the age that they both need care. Dad is younger than mom but he took a fall and has a very bad back. Mother is suffering from heart condition that really limits her ability to do around the house and go out. She is on oxygen most of the time and is so tired she is unable to care for dad. I have been trying to do things for them, but I have 3 teens at home and I am almost sick from exhaustion. What can I do now? Well the secret is always in the money isn’t it? If you have money to hire in help or even a limited amount you would be wise to get a house cleaner. At least the house itself would be tidy and you would not have to do that part yourself. Alternatives are getting family members to come and clean for less. We have a young mother with her baby that cleans for my sister. She is her grand-daughter so she pays her a little bit and the cleaning and visiting with grandma is all done together. If your parents have a faith-based life with a community attached, call and see if they have a retired lady or young mother that would be willing to clean each week for a small amount that you can afford. Just remember; it has to be clean. So when you get someone in…tell them what you want them to do. Make a check off list and make sure it is done to your liking. If not explain and see if they can improve or get rid of them. You can not afford to pay someone to sit and talk and have a sandwich instead of washing down the shower and tub. Be strong on any help you bring into your parent’s home. walk through the family home…think of how to add handles to places that need support if they have to bend down or step up. Take away throw rugs or things on the floor. Remove clutter of newspapers and stacked books or hobby things. Clean it up, make it safe. How are they getting out of bed? Do they need a shower bench or handles in the bathroom? Does their kitchen need to be sorted so the everyday things are at a closer reach. Be strong…make good, wise changes and let your friend use her eyes that are not clouded by years of loving the home and it being ‘your parents’ place’. Talk to your own family and tell them you need help. What could they do each week? Could they all come over on a Friday after school and get the yard cleaned, the garbage out, the wash carried up or down stairs, the bed changed….you know if you figure out that every Friday…you have a storm of duties and you all work. In two hours you will be free as a bird for the weekend. Go and fix meals for the week in one night ! Don’t tell me this can not be done, I do it all the time. It just takes planning and saves you so much energy. Stay there for dinner that night and have the family over for dinner. Make it easier for you to be in one place, at one time. Then buy nice Rubbermaid dinner containers and store the dinners for the week. You can freeze a few left over dinners. This way your parents just microwave the meals and eat good home cooking each night. A big soup, a nice slow cooker meal, pasta, a pre-cooked roasted chicken for a couple of meals. Come on, you can do it! They add their fruit and salads, cookies and treats. You get it all done in a swoop of one evening. It may take some thinking, but you will see it is doable and easier than coming over every day. No matter how smart and bright and gifted your parents are at this time. Take over the care of their medications. This one item could extend their lives. You simply have to gather up all their meds and find out what they are and why they are taking them. You write it all down and take it to the pharmacy where they will explain the medications. Then you list what is needed every day for each. IMPORTANT: You then add in the supplements that they should both be taking, Vit D – 1,ooo units per day / Multi-vit for seniors / Vit C – 1,ooo units / Joint compound 1-2 pills per day, per person. Ask the pharmacy when you ask about their meds if those supplements are OK to add. Now, once a week you fill up their daily pill containers. They never again worry about what pill when. You handle it all and simply leave the container there for them. Remove their pill bottles to a large bag in the storage room. You will now make the call each month to order the pills and try to buy them for a 90 day amount. Use a pharmacy that has a computer and call back system. Give them your cell phone, they should be able to call you once a month and tell you when they are ready for pick-up. Picking up pills and the worry of doctor OK’ing the Rx is a nasty chore, so make sure the pharmacy is up to date. (I use Walgreens and like their price and their computer program.) This is a key issue to care for seniors…medications are understood and given on time, every day. Make sure you mark the weekly pill containers with their names (I use nail polish or stickers) This way; medication is given to keep the pain away and keep their body functions going without the ups and downs of missing medications —-bodies feel and act much stronger. If they have to take food with their meds, make sure you get them into the habit of having a yogurt or small apple sauce container before they take their pills. Don’t be afraid to change oxygen delivery companies. One of the biggest problems with oxygen is poor service or delivery. If your mother needs to use her portable containers…she needs them. For her to wait for them is not acceptable. Make sure the oxygen machine is one that moves up to 10 and adds a little moisture so she keeps feeling strong as long as possible. Medicare pays for this service so make sure the money is spent on a company that is reliable. General cleaning of the house; like kitchen and bath is done weekly or twice a month by another person. Family, friend or professional. Bath lady is hired min. once a week to give your mom a good comforting bath. A clutter free area for a walker and ease of use is made by you and a friend as you clear up the house. Adding safety touches anywhere that a problem may arise. You enlist your own family to help on a weekly basis. You give out chores and they all go to work in a flurry of activity. The yard, the garage, the garbage, the wash, the big items that need repair are all handled and you can relax. You choose a day during the week to come and make dinners. You will be shopping for the food, have a menu plan at hand and then hit the kitchen. To make it easier you have your husband and kids join you that evening for dinner at the grandparent’s home. This is the slow cooker meal or the big pasta dinner. Leftovers and other meals are placed into nice storage containers that freeze and chill well. Salad mix, fruit, cookies, nuts, pies whatever their favorite treats are left behind. DONE = a week of meals for them to choose and microwave. Yeah. You take over their medications. You know and understand what they are and how they work and what time of day to give them. You buy new and load up the big pill containers for the week and your parents are now safe and snug as bugs in a rug. Check the service companies that are providing the oxygen, medications, bladder control or diabetes equipment. Make sure they bill properly to medicare and that they are easy to use. Do not be afraid to change. You may have to have the doctor re-write prescriptions, but this is just done once and then the ease of using a business that is good with their customer care is essential as your parents move into more and more use of medical equipment. Most of all, caring for parents in their home is done with your schedule not theirs. It is a hard thing to do, but you have to say…here is my time. I am here with you two days a week and an additional evening. I will call you each morning when I get to the office and each evening before dinner. You set the rules, you call and stay on the phone for less than five minutes. Your day is yours, your time is yours to set. Your parents? They adjust and begin to enjoy life without the worry that they are over burdening you. Blessings on all that you do for your parents. Care giving is not a fun ride, but it just how loving people live their life and honor those in their family. Thank you…now, do me a favor please. Would you please click the ‘Sign-up’ button and you will receive a notice when I have updated my site…and join me on twitter at @SeniorCareTips I try to add tips and help those that have questions on a daily basis. 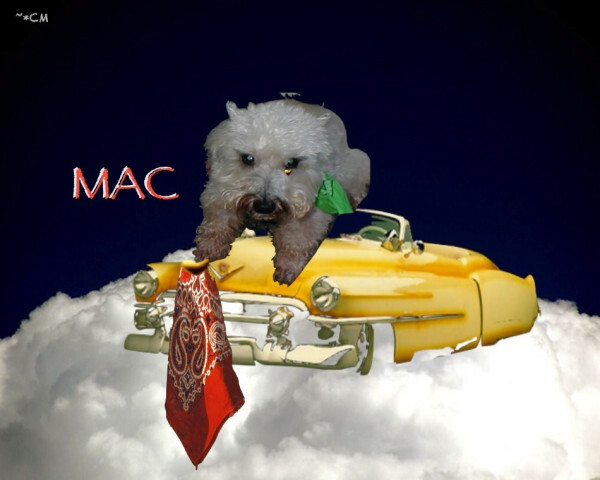 We lost our little hobo, Mac, in June…after being our sweetie pie for 15 years it was heartbreaking. Every anipal parent understands the loss of a family member..lots of tears are shed. For us; it had another layer of sadness because my husband has Alzheimer’s and any change sends him into confusion and any emotional hurt can actually take away from his brain function. Mac’s passing…was a very bad time. After his passing ‘Over the Rainbow Bridge’ Missy was left alone and very silent. Her quiet personality was stuck in an empty day that melted into another empty day. I was worried. She stopped eating, stopped playing with her toys and would just lay by the front door window and watch for her dear Mac to come back home. Not wanting Missy to be alone and sad and not wanting my husband to be without a lap dog to relax him and give him joy….the hunt for a new dog was on. But where to begin? I looked around on the net. There’s a lot of pets out there and I was totally confused. Then a dear friend of mine, involved with anipal rescue, gave me a tip. She said there is a group called “Golden Oldies” a pet rescue that finds older animals (8 yrs +) for older families. Yeah! My search was now guided in the right direction. I did not want to worry about a young dog with my husband’s condition. No potty training and chewing to go through…I was pleased to learn of the organization and found the different websites to be easy to use. But, I did have a problem with the photos that were placed for the pets. Since I was not able to run around and ‘look’ at the pets that were listed from all over the United States…I had to depend on the photo and the copy to find my next life partner. taken that you could hardly tell what breed they were. I wanted a small anipal, a boy, over 8 years and below 20#. I am a senior with a back problem and I did not want to have a problem picking up our dog. I love to give hugs and my husband loves to have the dog on his lap – small was key. We also needed a calmer personality in the dog, so I had a few breeds in mind and began my search. Many of the dogs had physical challenges from nasty homes or advanced age and many of them had personality challenges from losing their family. I was not worried about a challenge but I needed just the right mix. So, when I hit on a website from my own state and found a picture of little dog with a tennis ball in his mouth I was drawn in to look closer. 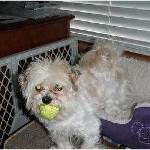 Looking at the picture the dog had a tennis ball in his mouth and I figured he was about the size of our Bichon, Missy. They would be well matched in size. The description was vague. 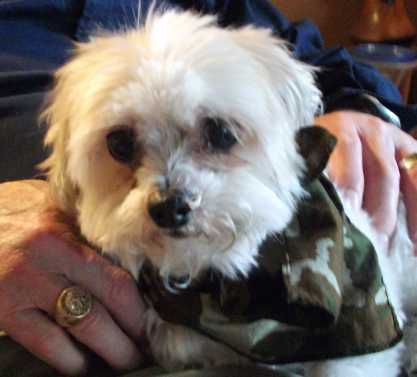 He was 10 years old and needed a new home, he had some problems with his teeth and loved to play ball. Sounded bouncy and fun…so I called. It had not been my first call, I had called many of the listed dogs and gotten people that did not know the dog I was calling after, or could not tell me much about their personality or past. I really wanted a dog I knew a bit about so it would fit our family. I did not want a dog that would not fit and have to be ‘tested and returned’. I thought that would be the worst thing to do for a sweet dog that needed loved…to reject them after they had come into the house. So, my calls were made and I was just surprised at the ability of the different services to give me information. I was somehow pulled tight into the picture of the dog with the tennis ball, inside a play-pen. I felt this was a dog that needed my love. After talking to the adoption people and planning a meet and greet…I was ready. I drove an hour to get to the meeting place and then waited another hour until the dog arrived. I was quite surprised at the size, he was tiny only six pounds. He was a mixture of Mal-Shi. A shy quiet little guy with a strange potty band around his private parts to keep him from squirting. 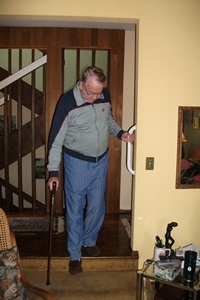 His back left leg had been damaged in a fall and he drug it along as he walked. He had spent his life in a small play- pen during the day and then in the arms of a loving mother after she returned from work. They told me he had nervous pee problem and bad teeth, but they had just been cleaned. I found out that photo of the tennis ball in the dog’s mouth was a tiny little ball..not a real sized tennis ball. I did not know there was such a thing, nor had I ever had such a small dog. My heart took over and the dog came home with me that day. Little Kirbee was in for a big surprise. Our home has three floors of stairs and a big fenced backyard. Missy is a playful pup that demands a lot of dollie and ball playing during the day. Potty pads on the floor are fine, but big boys learn to go potty in the back yard and so Kirbee had his work cut out for him. Changing his food to a full protein mix of Nutro small bits of Lamb n Rice and adding Missing Link would be a must. Missing Link is a supplement that I have always used with my older dogs. It gives them more energy and helps their arthritis pains. Then I added a great supplement called Proden Plaqueoff that works on reducing plaque build-up on the teeth. We put down a rule of NOT picking up Kirbee before 4PM…he had to move. And move he did…falling in a heap and sleeping after hours of play. The first week was exhausting for the poor little thing. Hobbling up and down stairs, trying to retrieve small balls and finding brand new toys to squeak and chase. 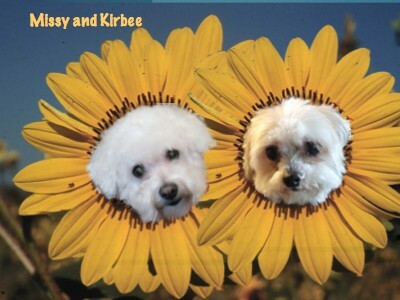 Kirbee used his potty pads well, but started to slowly understand that going outside to potty was regular and often. Slowly week after week, that back leg got stronger. The foot got exercised into more solid footing and before we knew it, he was flying ahead of Missy to go out to the back yard each morning. Now, he is demanding toy time from us…he follows us around with his ball in his mouth and we are expected to keep up with him! Naps are spent on dad’s lap and daily walkies find Kirbee in dad’s basket of his walker. If you would like to see one of their walks here is a little clip. Little Missy has found her new brother quiet and easy going. He has cozied up to her side by her favorite front door window to watch the neighborhood activities and share her dollies. With all the dogs that were available for us, we found just the right one and it was all because of that silly photo of a dog with a tennis ball in his mouth. It was such a great joy to find that a kindred spirit was featured on the “Sunday Morning Show” on CBS. News Video of Amanda Jones , a professional photographer, was featured with her pet photos. She has started using her talents to take wonderful photos of dogs that are ready for adoption. These photos show the dog in a perfect light, so the pictures can be used on the Internet and bring interested new families into the pal’s life. The amount of dogs adopted from good photos is staggering. Just a simple click. A simple good photo featuring the ‘best side’ of each dog…has made the difference. Each time Amanda snaps her camera… a dog’s life is saved. She personally works with a small adoption organization and she has dramatically raised their adoption rate! Amanda is now training other photographers to give their time and support to this issue. She is asking them to take up the cause of an animal adoption group and do the photos for them. Photos that show the inner cute, cuddles and love of each anipal. Photos that capture the heart of the family and bring them together for a ‘forever home’- match. Watch this great piece and see what you think. Are you a person that loves to take pictures? Could you spare an afternoon every couple of weeks to take pictures of anipals that will SAVE THEIR LIVES? If so, go and visit Amanda Jones’s website and find a group of adopted anipals to help. You could change lives just with a click! Seniors need to have something to hold and love. Loneliness adds to health challenges. Change your life — give your love to a senior pet. Let the senior pet that has no one to care for them, that has been left behind– find a home filled with hugs and love from you. Find out more about Golden Oldies and enjoy a great dog info blog. It is hard to decide when to call for help when you are in the middle of care giving. My brother –in-law was moving downhill with his cancer and the veil of pain and fear were starting to blur. 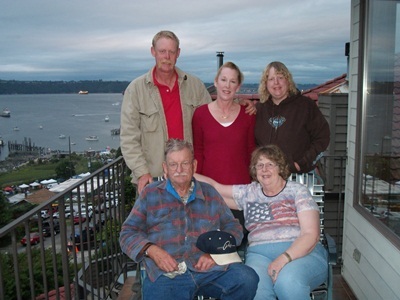 After years of fighting lung cancer, the fight seemed to kick into high gear fast. There was no day/date stamped on him anywhere to know when to call for that extra help that Hospice gives. The idea of Hospice had taken over my sister and brother-in-law and they felt it was like saying; “the end”. It kept them from the call for help and they suffered alone as the daily tasks of living were beginning to close in around them. As his breathing got more and more difficult, his mind lowering in clarity from reduced oxygen – it was making days, night sleeping and common chores harder and harder to achieve. Finally, the day came…when there was no ‘feeling better, tomorrow’. The call was hard for them to make and the first visit of the home nurse was tentative. Did he want a special bed? ‘NO’ Did he need a walker? ‘NO’ Their conversation was rough, short and difficult for all concerned. The Hospice nurse had been down this road before, she knew the signs and she just told them she was there…it was their choice and they would take baby steps together. Within just a few days of that first visit; the situation had worsened and another call was made to Hospice. This time the services were really needed and they started to roll in the door. The cancer was making him feel so weak that he was unable to go into the bathroom alone. Walking was impossible and eating had long-lost its appeal. His oxygen levels were so low that he was unable to catch his breath. The fear and worry that my sister felt, watching him suffer, was overwhelming. Hospice could hear it in her voice as she called them backed and asked how they could help her. This time the flood doors of care suddenly opened. Out poured professional help that was organized and calming. Hospital bed loaded down with memory foam mattress and adjustable controls moved into the front room. The home had a fabulous view of the Tacoma harbor and the sun filled every inch as they moved out furniture to make a place of honor for the bed. An ‘over the bed’ table was adjusted in place so it could be used to hold his basket of personal tools. Finally he could sleep in a bed instead of in his chair. His chair was honored with a gel cushion to give his thinning body comfort. A commode was put into place by the bed during the night and over the toilet during the day to give arms – used to steady and help with standing back up. A wheelchair; small enough to go thru tight places and still hold his tall frame securely was delivered. A new oxygen machine that would dial-up to 10 PCI and add a little water to the mix to keep the nose moist while using the air was set up. During the next week, a cleaner arrived to scrub down the shower and vacuum any dust away so my sister could concentrate on care of her husband, not the worry of keeping the house clean. The nurse arrived to take down the medications and adjust them for pain relief and put all the pills for the week into a larger daily pill container marked with four times a day. The pills that had once been on every table in the living area were now brought into order and ease of use. No more confusion or missed pain medications, it was all organized to remove the confusion. Very intricate information was written down in a simple and easy to read hand for my sister to administer the morphine at just the right time during the day. A list to write the timing and the result of the dose was established and put in a place that was easy to find and use. Common nursing tips and transfer training were also shared. Food suggestions and how to’s were left so the small intake of food for my brother-in-law would be productive and comforting. Explanations of how to use ginger ale for stomach gas and calming was added into the mix. Simple suggestions and easy to do things that made a huge step up in the care giving and comfort level were carefully explained and examples shown. The change in comfort was immediate and the feeling of panic and worry began to be replaced with confidence. The bath lady arrived…after first being rejected as a privacy issue…she was now welcomed and able to prove her skills in giving a bath to someone who could hardly move or breathe without great labor. The bath was finished in quick order and a light massage was given. My brother-in-law returned to his chair feeling clean, warm and relaxed. A simple service that a trained professional gives can lift the spirit. 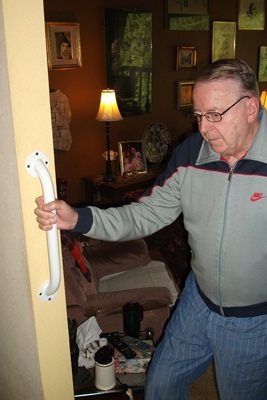 Instead of the worry that their son had gone through when he had changed the shower head and added the support chair. Then he had added his dad and tried to help him with the shower, the discomfort was high and the experience was exhausting. Not now. Now the bath lady has the senior in and out of the shower with time to spare. A Chaplain showed up on the doorstep; just to introduce herself. Not wanting to intrude on comfort or spiritual issues…she just shared time with my brother-in-law and took in the family dynamics around her. As she met each family member, she chatted easily and yet expertly with them finding their point of pain and bringing it up into the light. Each time another issue came to a head, my sister was now able to call and get an RN to return her call and assure her of steps to take to keep the care in a positive mode. As the care became more intense, the time of sleep began to dwindle and the help line to the support system grew. When talking to my brother-in-law the Hospice team noticed that he was a long time retired fire fighter in the city and they asked what station he worked. One of the team stopped by the Firehouse 13 in the north end of the city. A couple of days later, the large fire truck pulled up in front of the house and out came the young men from his old firehouse. Entering the house and standing around my brother –in-law they gave him support and respect of service. They chatting about old stories and thanked him again for all of his dedication to his duty ‘in his day’. The view of those young men surrounding my brother-in-law as he carefully worked for each breath of air was so over-powering. Honor; it is so important…emotions and love are so dramatic. My brother-in-law was empowered by the visit – his heart soared high that night. His adult children that had all planned a weeklong camping trip before the Labor Day holiday now put it on hold. They all rallied to the side of my sister. One stayed over at night; (leaving her family of a husband and two young sons) then returning to her own home to care for family during the day. Then she drove over to her mother’s at night to fix dinner and sleep so she could help with nighttime care. Their son came over every morning early to prepare a good breakfast, fix anything that needed attention and give his dad help with the daily challenges. The other daughter (with a young infant that was sent to the day care) spends time with her family during the day to keep her Dad’s spirit high as he struggled through the pain. The journey to life’s end, when you’re fighting cancer, is never a breeze no matter how brave and how the patient fights. But, it can be easier and calmer when you just reach out and ask for help. Hospice is not the ‘end’— it’s the beginning of care and attention that assists a family and patient through life. It is as important as the highly trained pediatric care team is for newborns. It is just a call away – please make that call. Don’t wait for fear and exhaustion to take over and make the journey even harder. At this moment, we are all working through the end of life issues with my brother-in-law…but now we are all a part of team that belongs to him. Each of us bringing our skills and special love to his side to ease his days and fill his nights. Honoring all that served…even if it was a long time ago…serving our country, community and family counts. We thank you for your service and embrace your life’s story. Here is to Hospice…and here’s to a caring family that understands just giving their time and love makes a difference in the journey towards life’s end.